For land use planners, balancing community growth and environmental health is always a challenge. But after months of pilot testing, IISG is putting the final touches on a new web-based tool that will help them do just that. The Tipping Points and Indicators tool uses the latest watershed research and cutting-edge technology to show planners where aquatic ecosystems in their area are in danger of crossing a “tipping point,” triggering rapid and sometimes irreversible shifts in how they function. 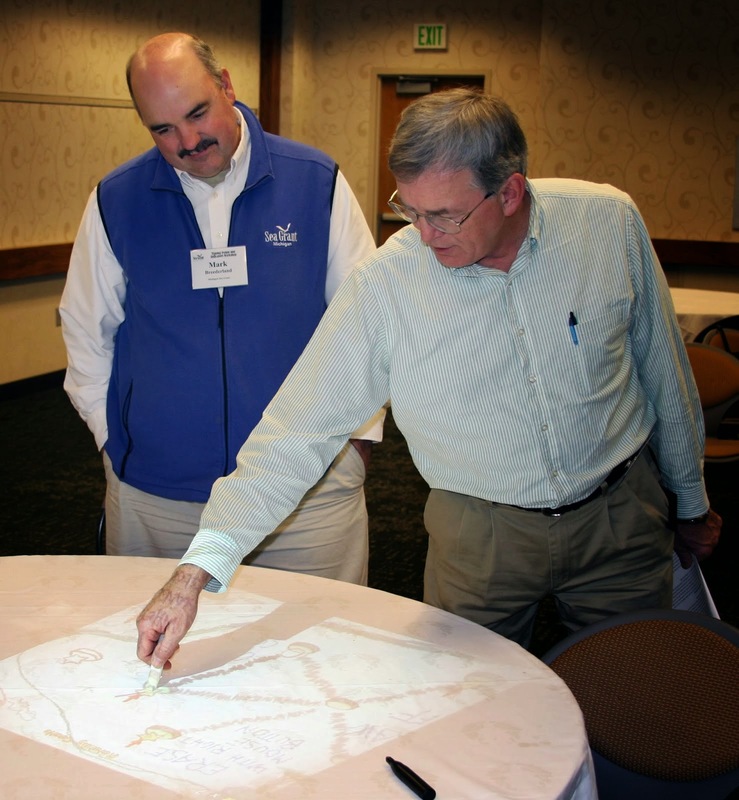 With help from a Sea Grant facilitator, planners can use the tool’s interactive maps, simulators, and recommended response strategies to develop watershed-specific plans that prevent ecosystems from being degraded beyond repair. Specialists from Ohio, New York, Minnesota, Wisconsin, Michigan and Illinois-Indiana Sea Grant programs have spent the last few months testing the tool in broad range of communities and divers audiences. Planning groups from the industrialized southern Lake Michigan to the more preserved northern Wisconsin and Minnesota can now use the decision support system to kick off the watershed planning process. In Indiana, Ohio, and New York, facilitators have also introduced planning consultants and state employees to tool modules so they can take the process back to their own communities. Experiences so far have been positive, with many users expressing excitement about the role Tipping Points and Indicators could play in improving watershed planning. Community members, local officials, and consultants were particularly interested in the tools’ recommended policies, ordinances, and outreach efforts tailored to local needs. In fact, a watershed advocacy group from the Duluth area mentioned they could have spent a whole day on that module alone. To further enhance the tool, users also recommended making maps and planning strategies more watershed-specific. Many of these refinements are being made now. Others, including the addition of the new land cover data and models that predict future tipping points, are expected in the coming months. And as the project grows, so does the lead team. Last month, IISG brought Purdue software developer Brandon Beatty onboard to help boost the usability of Tipping Points and Indicators and ensure it continues to rely on the latest research and technology. The tipping points tool is part of a four-year project funded by NOAA and EPA and coordinated by Illinois-Indiana Sea Grant. Partners include Purdue University, University of Michigan, Michigan State University, University of Minnesota Duluth, University of Windsor, Great Lakes Environmental Research Laboratory, the Cooperative Institute for Limnology and Ecosystem Research, the Great Lakes Restoration Initiative, and the Sea Grant Great Lakes Network.